The recession in Belarus has continued for the second year running. GDP dropped by 2.5% in the first half of 2016. 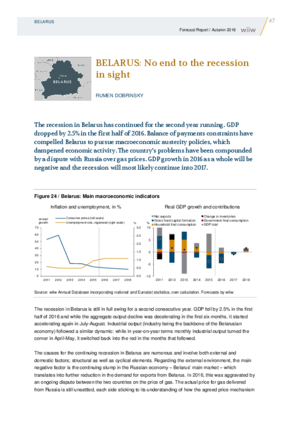 Balance of payments constraints have compelled Belarus to pursue macroeconomic austerity policies, which dampened economic activity. The country’s problems have been compounded by a dispute with Russia over gas prices. GDP growth in 2016 as a whole will be negative and the recession will most likely continue into 2017.